In the Gerviškių parish (the Šalčininkų region) the renewed cemetery was consecrated. The villagers who lived in Gumbi are buried here, they were murdered by the German Nazis in April 1944. The reneval of the cemetery was a part of the project “Save from oblivion”, implemented in the Šalčininkų region by the Association Odra-Niemen from Wrocław. 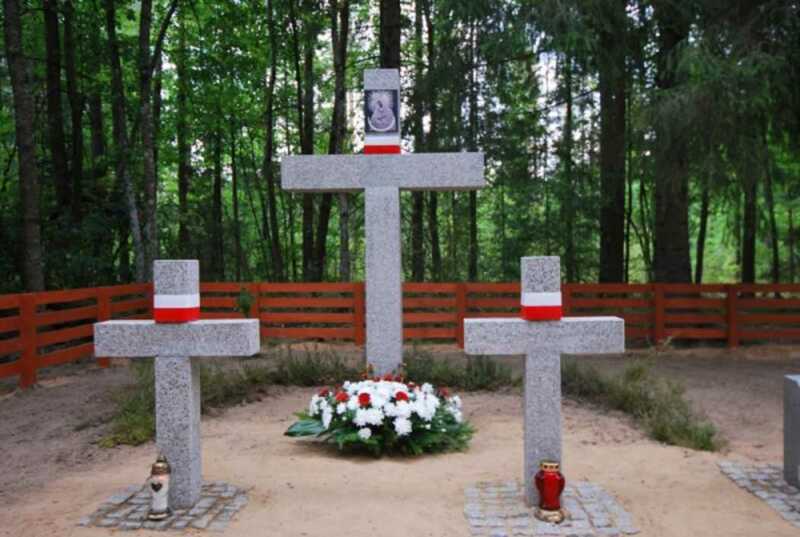 Within two weeks, members of the Association Odra-Niemen from Wrocław and Poznań, the Association Traugutt from Gdańsk, the Głogów Patriotic Association and a large group of volunteers from the Vilnius Association of Poles in Lithuania “Vilnius Patriotic Youth” were working at the cemetery. Residents of surrounding villages, representatives of cultural institutions of Baltoji Vokė and Šalčininkai as well as the local government administration of the Šalčininkų region also helped a lot. Participants of the renovation replaced destroyed tombstones with granite crosses (six small and one large) and the whole area was fenced by a wooden fence. The consecration of crosses took place on the 29th of July. Apart from the project team, local government authorities of the Šalčininkų region were present: the deputy mayor of the Šalčininkų region – Andrzej Andruszkiewicz and the vogt of the Gerviškių parish – Valerijus Iwaszka. The crosses were consecrated by the parish priest – Joseph Narkun. Tłumaczenie by Anna Piecha	w ramach praktyk w Europejskiej Fundacji Praw Człowieka, www.efhr.eu. Translated by Anna Piecha	within the framework of a traineeship programme of the European Foundation of Human Rights, www.efhr.eu.